I recommend watching the full tv series first before watching this because it involves all the characters from the tv series and does not provide any introduction to them. The time frame seems to be set before introduction of the witches but Yamada and friends already knows most of them. The plot doesn't really build onto the main one nor does it expand on any of the characters much. The comedy is present mostly in the first OVA with sight gag similar to the tv series. The second episode focuses more on tracking people down and showing the characters going from one place to the another instead of developing them, similar to the tv series which I don't find that aspect to be particularily interesting. If you've seen the tv series and you really liked it, I would say it's probably worth a watch. But if you are you on the fence here are synposis (Minor spoilers): The school's cultural festival is happening soon, and with it the performance festival. There's a hefty monetary prize for winning and the supernatural club wants to participate to win. And so the Yamada and friends spends their time to think of what to perform and proceeds to participate in it. Story - To not spoil you , they will participate in a club competition . 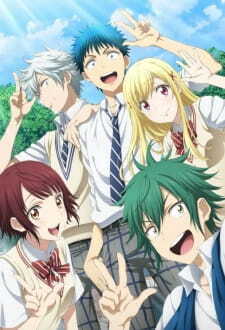 Enjoyment - Since i liked the plot and storyline of the original series so i enjoyed this OVA so i give it a 7. The graphic is good as usual. A great addition to the anime, which would take place between episode 10 et episode 12 (everyone knows each other and the witches still have their powers - even if not all the powers are shown -). As always, I won't sum up the events but just give my personal opinion. The OVA doesn't put an end to the anime's ending (considering the manga wasn't finished right after this event) and just acts as something cool which was added to give me more screen time to the characters (in an ovbiously funny and soft way). So basically you will get to see every major characters + every minor characters (except a few) put all together in a canon story. It should be seen after you watched the 12 episodes, so you can understand every aspect; without that, it might be a mess. There is no addition to the original plot but it remains very funny to watch, with a cool song at the end. I consider it as a "good bye" to the viewers, but not something radical (unlike Kill la Kill's OVA, which acted as a "no more screen time for the anime, thank you for watching and understanding"). To me, it would have been a decent transition between season one and two, to make people being patient... but there is no season 2 and there won't be any - 99.99% sure -. So yeah, I really think it should be taken as a friendly last screen time for the whole anime. Don't be sad though, the manga - even finished nowadays - adds a ton lots of stuff. I started reading it after I watched the anime : highly recommended !